How much does a non-prime consumer lender spend to acquire a borrower? According to Elevate’s Q4 earnings report, the company spent less than $150 per borrower to originate $31 million in loans towards their partnership with FinWise Bank. 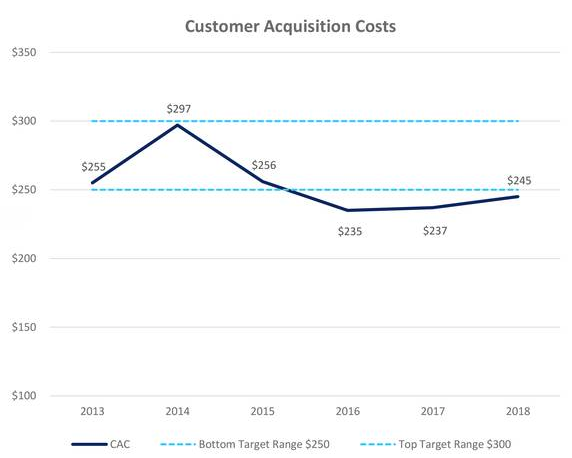 Overall, however, their cost of acquisition has hovered below $245. Elevate offers three products to non-prime customers: RISE, a state-licensed online lender that offers up to $5,000 in unsecured installment loans and lines of credit, Elastic, a bank-issued line of credit, and Sunny, a short-term loan product for customers in the UK. RISE and Elastic serve the US market. Separately, Elevate reported $787 million in revenue for 2018, an increase of $113 million, or 17%, compared to 2017’s full-year revenue of $673 million.